What a gorgeous peacock! And a fantastic capture! I love your composition -- as always! Hope your day is going well, JM, enjoy your evening! I think he's showing off for you! I think he was posing for you. They are such elegant birds. Gorgeous shot of a majestic bird! The picture from yesterday was so unusual and a pretty slice of nature. What a regal looking bird! The word that comes to my mind when seeing this is: regal. Great photo. It looks like a beautiful place. He's stunning!! Boom & Gary of the Vermilon River, Canada. A beautiful image of a lovely bird. Such a beautiful bird. He looks like he's found a lovely, shady place to pass the time. Nice capture! Wow, JM, what a beauty! Now that's a proud peacock! Nice capture, Jose'! WOW look at that tail!! Its amazing. It's tough to compete with a peacock for an imaginative outfit. It looks like a lovely day in Oeiras JM. I'm liking that accuweather gadget! High regards to you Sir! A handsome peacock waiting for the clouds. In India we say that they start to dance when the clouds show up. If it stays in the shade, it won't climb on your car and leave a pile there. He is really magnificent! Great shot! Look at the length of that tail! 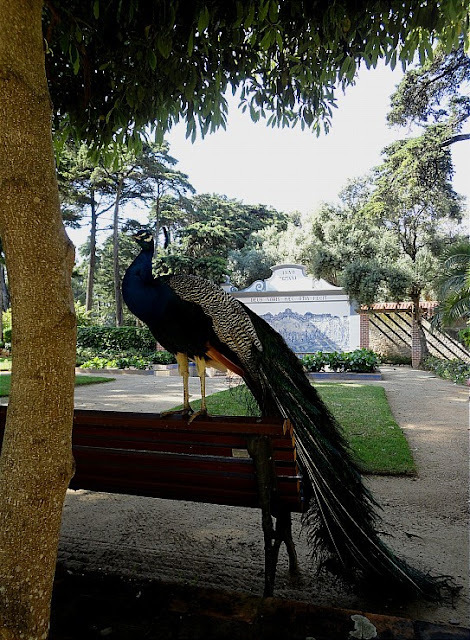 The peacock is such a stately bird, perfect for roaming in nice estates. I don't know much about peacocks, but they sure are pretty...we have a few in south Florida in local parks but they're rather skittish...looks like you got pretty close to this one! Peacocks are such spectacular birds! Your comment about making original comments made me laugh, I don't know how many times I've done the same thing!